Stationery Direct is pleased to be able to offer some attractive prices on envelope printing for your business. We offer C4 (324mm x 229mm), C5 (162mm x 229mm) and DL (110mm x 220mm) white self seal envelopes, with the option of window or non-window at no extra cost. Why have your envelopes printed? A printed envelope will create the right impression from the minute it arrives at its destination. Your personalised printed envelope will allow your client/customer to easily identify your brand as one they know, separating it from ‘general’ mail whilst attracting new clients with its professional appearance. Do you want to maintain a professional and refined look across your printed business stationery? A printed envelope will do just that, and with single colour or full-colour print available, your envelopes can match your existing stationery. 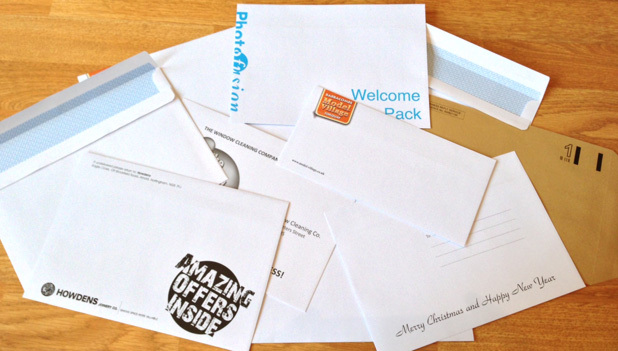 If you have any questions about our envelope printing services then do not hesitate to get in touch.